bride.ca | Hot Bridesmaid Colours for a Cool Winter 2010 Wedding! 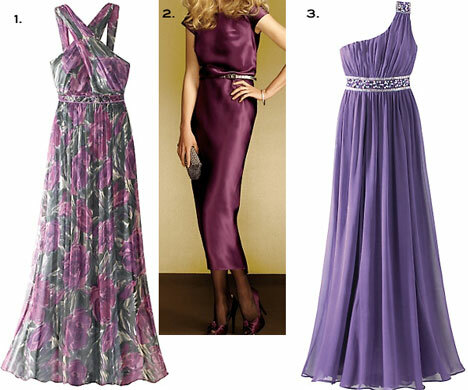 "Purple is by far the number one colour in fashion this season. It's both refined and elegant with a hint of frivolity and excitement.".. It's time we faced facts and dealt with the reality of summer being officially over. With that in mind, let's look forward to late fall 2009 and winter of 2010 and discuss this season's hottest colours for your bridesmaids. Straight off the runway and fresh from New York's fashion week, the verdict is in: Purple wins!. Purple is by far the number one colour in fashion this season. It's both refined and elegant with a hint of frivolity and excitement. It tops fall 2009's top-ten list of colours. But, what else do the world's fashion gurus have planned for us this year? Red: a balanced true red makes the cut too. It is perfect for all skin tones and is a "feel good" colour. Yellow: a warm, honey yellow will carry through fall and winter this year. Pair it with its colour wheel opposite, purple, and your bridesmaids will be the toast of the wedding season! For a more typical combination, pair honey yellow with an earthy shade of orange. Iron: the new black is neither black nor brown nor gray but something in between. Iron is hot, very hot in the wedding and fashion world right now and serves as an anchor which means it coordinates well with other colours. Neutrals: timeless neutrals are taking on a new look this year. Grayed down beiges or colours between light gray and deep beige are classics and serve as anchors when paired with other colours. They are versatile and classic. Orange: fall would not be complete without some form of orange in the mix. This year's orange is a deepened earthy shade that reminds us of an autumn sunset. Want to mix it up a bit? Try pairing this orange with iron or rose. Very chic! Rose: did someone say pink for winter? Yes, we did but it isn't necessarily a spring/summer type of pink. This is a rose coloured pink that falls somewhere between a vibrant fuchsia and a soft baby pink. This hue definitely is livening up the more traditional icey-cool hues. It is also huge in make up and accessories this year. Olive: really olive green? Yes, really! Think warm olive, like a rich yellow green. It is this year's choice for elegance and sophistication. It is an intriguing tangy colour that makes other colours combined with it come alive! Blue: Jewel tones in general are big this year. But, a deep teal blue is one that has caught the attention of fashionistas around the world. It is more vibrant than navy and brings and exotic flair to the colour palette this season, especially when it is paired with purple or burnt orange. The above colours are defining fall 2009 and winter 2010. Keep in mind however, that these colours offer us a direction but they don't necessarily create the defining look of the season. Their true appeal becomes apparent by uniquely integrating them. Creating the perfect combination will bring cutting edge style your wedding and will make your bridesmaids love you all the more!!! !